Version 1.7 works much better. Everything is easy and intuitive to use. Any idea what you plan to charge? Is it possible to have the sender's e-mail address linked as mailto: in the e-mail sent via the form? In the same way that the website URL is now linked. Or better still, as I suggested before, have the sender's e-mail appear in the e-mail when you respond to the submitted form. Also, the auto response works fine but it would be great to have more control over the color and contact form generator free fonts. I do have a question about how to add one of these forms to my website. When I copy and paste the HTML code into my page, the formatting is lost. 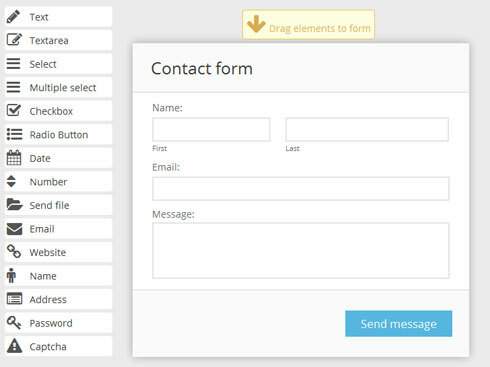 How do I get the form to display properly when I add it to my website. In the attached, the form on the left if how it looks when I preview the site in my browser. On the right is when I have copied the code from the index file and add it to my index.html file. Hello, about this new Formoid tool. I have to say that in playing around with it it looks really great, but I actually had a question for you. Hi thanks for this, it looks very good how do I set where the data is sent please? is this the URL ? what form is it sent in?